Jockey Robbie Power gained his first success in Jump racing's Blue Riband event, after the Jessica Harrington-trained Sizing John registered a two and three-quarter length victory in the extended three and a quarter mile test. Power, registering his third victory at the Festival and his second of this year's meeting, led approaching the final fence aboard the seven-year-old son of Midnight Legend and produced a superb leap at the last before keeping on well for pressure up the Cheltenham hill to score. Jonjo O'Neill's 18/1 chance Minella Rocco made late headway under Noel Fehily to finish second, with Colin Tizzard's Native River (7/2) a short-head back in third. A delighted Power said: "It is unbelievable. Jessica Harrington is a genius. I always said that when Sizing John stepped up in trip it would be the making of him. "It was 10 years ago when I won the Grand National, I'm 35 now and appreciate this a lot more. It is fantastic and big thank you to all the team at home - they do a top-class job. This means more than any other winner I have ridden for Jessica." "I had a lot of confidence in this horse. Since the first day that I rode him behind Douvan, I felt that all he did was stay. We went gradually to two and a half and then three miles in the Irish Gold Cup and up to three miles and two today. "I was always fully confident that he would stay. I have given plenty of Cheltenham preview nights and people were saying it was a bad Gold Cup - I was kind off insulted because every good Gold Cup winner has G1 form over two miles. He had it over two miles behind Douvan and he had that bit of speed. "I ended up jumping my way to the front at the second last. I didn't want to jump to the front until the last but when I was there, I had to keep going. I was confident when I jumped the last that he would gallop all the way up the hill. "I had an unbelievable run. The plan was to be middle of the fence and keep out of trouble because he is such a good jumper but, when we jumped the first, I was getting crowded on the outside, so I took a chance and switched in. Everything went perfectly but, when you are on the best horse in the race, things do usually go perfectly for you. "The first day I rode him, I said that we would go further. I felt at Thurles, the stamina kicked in and he didn't win until he met the rising ground. The Irish Gold Cup wasn't a strongly run race and he was a bit keen the whole way but we went a good gallop today. He latched on coming down the hill the first time but he probably thought that we were finishing that time because he is used to running over two miles! "He was just unbelievable. He is such a good jumper and it's an unbelievable. Thanks to Ann and Alan Potts for letting us go up in trip with him. When he won the Irish Gold Cup, we said that we would come here and take our chance. Ann and Alan have been rewarded. They have put a lot of money into the game and I am delighted for them as well." Sizing John's 7/1 victory was a first in the championship contest for trainer Jessica Harrington, jockey Robert Power and owners Ann and Alan Potts. Sizing John, a seven-year-old by the British sire Midnight Legend, was Harrington's first-ever runner in the race. It was her second winner of the week - she also took the Coral Cup Handicap Hurdle with Supasundae - and a 10th Festival success in total. She is the winning-most female trainer in Festival history. Sizing John beat second-placed Minella Rocco by two and three-quarter lengths. Harrington said: "I can't believe it. He was absolutely amazing. His jumping, the way he travelled. He was absolutely fantastic. It's unreal! It's thanks to Robert - he's the one who said at Christmas, 'he will stay'." 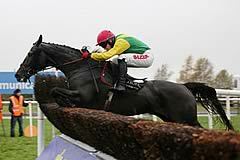 "Sizing John has gone from two miles at Christmas to winning over three miles and two furlongs here. He jumped like a buck and it is his jumping that has got him there the whole way. He was amazing. "It is a first runner in the race for me. I have never had any stayers before this. A big thank you to everyone at home. It is a big team and everyone has been fantastic." Alan Potts, who moved Sizing John from Henry de Bromhead's yard to Harrington in the autumn, said: "It's the first horse we have ever run in the Gold Cup, and only a couple of weeks after we won the Irish Gold Cup [with Sizing John at Leopardstown in February]. Pretty good! "It has always been our dream to win this, ever since we got into this game about 12 years ago. I invest heavily so that we can hopefully pick the best horses, and when you win a race like this, this is unreal." Minella Rocco, trained by Jonjo O'Neill, flew home for second, two and three-quarter lengths behind Jessica Harrington's decisive winner, Sizing John. Noel Fehily, Minella Rocco's rider, said: "He ran really well. I was flat out all the way but he stayed on well up the hill." Native River was a short-head behind the second and connections were delighted with his run. Richard Johnson, rider of third-placed Native River, commented: "He ran really well. I have no excuses and we were just beaten on the day." Garth Broom, part of Brocade Racing which owns Native River, said: "He is a seven-year-old and you can't be disappointed. He ran his heart out like he always does. I'm delighted with him. We'll see how he comes out of this race but then we'll see. He will probably go to Aintree if he is OK. He has come out of most of his races fresh but you can't expect him to come out of a Gold Cup bouncing. "He wears his heart in sleeve. I'm so proud of him. We achieved one lifetime ambition of having a runner in a Gold Cup so we are very proud of him - it's marvellous!" Jonjo O'Neill, trainer of the second, Minella Rocco, sent off an 18/1 chance, said: "He ran a cracker and I am thrilled to bits with him. "Noel (Fehily) gave him a great spin and he stayed on well up the hill - he probably wanted a little bit further - I get [couldn't pick up] the winning post and run any further but I would've if I could! "The winner won well and we were a good second so I am thrilled to bits with him. We will think about his future plans later." Colin Tizzard, trainer of the third home, Native River, and Cue Card, who fell three out for the second year running, said: "He (Native River) has run his heart out and has done absolutely nothing wrong. "He stayed right to the line. There were just a couple better, one staying on and one to fast for him. "I saw Cue Card gallop back." Rich Ricci, owner of the 3/1 beaten favourite and fourth, Djakadam, said: "It didn't look like he stayed. It is heart-breaking but no excuses. He wouldn't have beaten the winner. "Gee, how good is Douvan. It was a great run from Jessie Harrington's horse (Sizing John) and a great result for her. It has been that kind of a season but we will be back." Willie Mullins, trainer of Djakadam, added: "I don't think we have any excuses. He jumped well and galloped well. What more can I say - it just wasn't our day. A great day for Jessie."